This means that everything I do is an artistic (as well as a sacred) act — it’s a Magical Dance with Beauty. Thus, I actively search for meaning through synchronicity, symbols and archetypes. As such, it suggests something profound about my relationship to reality as an artist. I tend to be much more fluid than conservative in my World View. 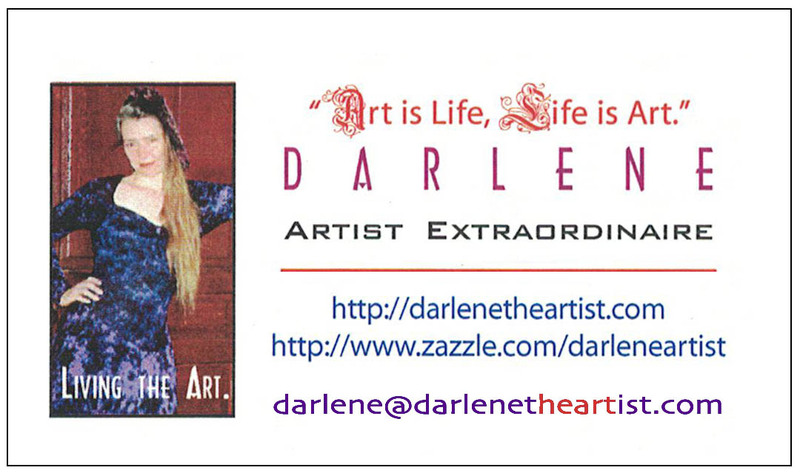 Darlene’s most current business card. With more and greater possibilities, fantasy totally encompasses reality. It’s outside the limiting, containing box, an opening of more ways people can relate to their world. Why not perform a cosmic dance on an asteroid? Or swim with the mermaids under the sea? Fantasy is my state of being free. I’m not totally mental. My freedom is tempered by the knowledge of my physical surroundings and the shared reality of the people around me. But because I believe more, I see more. I’m not stuck in my own little world when it comes to “consensual” reality. Oh, I’m always aware of my surroundings and what is expected. But at the same time, co-existing and super-imposed upon it, is a dream-scape of incredible splendor. That is the state of mind I enter into when I create. Maybe there’s something to not taking reality so seriously. Gloomy reality doesn’t have as much of a grip, or a pull on my outlook. Of all the cruel happenings in the world today. I choose to shift my focus away from the negative. A wonderful friend once introduced me to the concept that, whenever I view in the media or aired on television, the aftermath of a tragic accident, to scan the scene for the helpers. They are always there. Often, they are behind the announcer. Notice the helpers behind the scenes. Witness the miracle of their presence. When you do this, you can truly “see” the miracle of them in action, and forgo the disturbing details of the tragedy, the fear and the violence. Truly, I believe focusing on the positive, while acknowledging the negative, is the best way to navigate around the invasive, in-your-face evil that parades so openly now-a-days. What if I choose to believe I can effect positive change by energetically adding my healing intent to the scene (and to my art)? As long as I have no attachment to out-come, there is no ego-investment to taint the process. Isn’t keeping open to potential (as opposed to despair) a better use of one’s energy? Art is my Life. I work through the lens of fantasy, possibility and potential. The art I bring forth integrates the meaning of symbols, psychology, and archetypes with images and words. I dedicate my art towards the empowerment of the feminine, the delight of the imagination, the freed intuition, to heal, and to inspire the young at heart. Thank you for being my witness. This entry was posted in Life As Art, The Creative Process, The HEALING Aspects of ART and tagged art is life, celebration, encouragement, fantasy, helpers, inspiration, possibility on April 20, 2018 by Darlene.